Pull into the driveway of any rural farm or homestead and you are bound to be greeted by a dog or two. 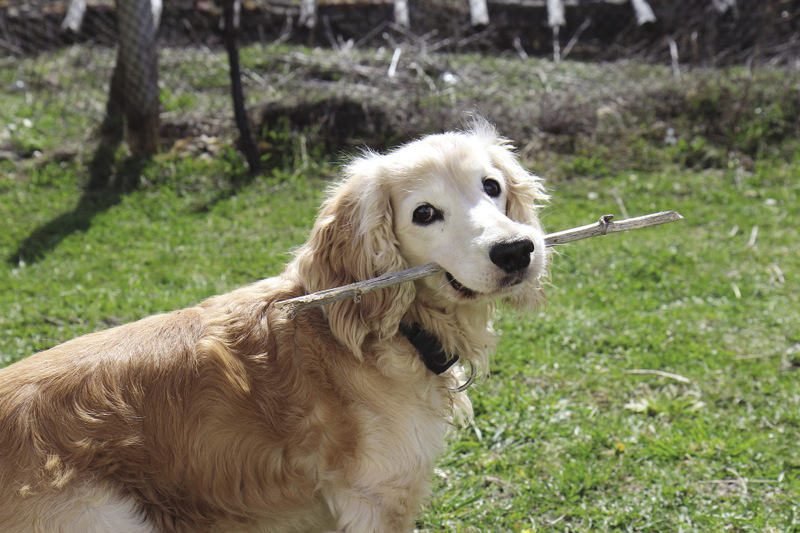 Dogs become an integral part of many homesteads as livestock and property guardians or hunting dogs. Living in rural areas, we value our dogs for companionship as well. They often become part of the family. Keeping our homestead dogs healthy, and finding minor issues before they become major problems is important. As homesteaders, learning to do things ourselves is part of our nature. Learning how to assess your dog’s health and provide preventive care at home can go a long way toward keeping your dog healthy and comfortable, and can save you money on veterinary care. Start with a good bath and brushing. Regular bathing and brushing are important for keeping your dog’s skin and coat healthy. A coat that is free of mats and undercoat will allow for good air circulation down by the skin, which will help to prevent the growth of yeast and bacteria. While you have your hands on your dog, feel around carefully for anything unusual. Are there any new lumps or bumps? How about rashes or sores? Any new developments should be watched closely, and make sure you point them out to the veterinarian on your next visit. If the lump or bump gets larger or has any sort of discharge, call the vet for advice. Shave the hair away from any rashes or sores, and wash the area with a good antibacterial soap. Follow up by cleaning as needed with the antibacterial soap and then applying an antibacterial ointment daily until the area is healed. If you don’t see a clear improvement after seven days of treatment, it may be time to call the vet. Acting on these things quickly can save you a lot of headaches down the road. While you are bathing your dog, check the ears carefully for any redness, odor, or dirt and debris. Dirt and debris should be cleaned away with a gentle ear cleanser and cotton pads. Redness and odor can signal the start of an ear infection. Usually, acting quickly with an enzyme ear solution, such as Zymox, will clear up most ear infections before they become serious. Follow the package directions carefully. The enzyme solution works best if you do not clean out the ear before applying the product. If you don’t see improvement after the recommended treatment, call the vet for advice. Keeping the hair plucked or trimmed from the inside of the ear canal allows for good air circulation and helps to prevent ear infections that are caused by yeast or bacteria. Ticks also like to hide in the folds of the ear, so be sure to check for them regularly. Clipping your dog’s toenails monthly is also important, not only for his/her comfort, but also for preventing future problems. Toenails that are left to grow uncontrolled can get caught on things and be ripped off, or even grow around and into the pads of the dog’s foot. When something like that occurs, a trip to the vet is almost always necessary. Long nails can also contribute to slipping injuries on a wood floor or other solid surface. It’s also important to examine your dog’s feet on a regular basis. Check in between the toes and the pads of the feet for signs of fleas or ticks. If your homestead dog is into everything — like mine is — you may need to do this daily. Ticks especially love to hide in those moist areas. If you do find a tick, pull it out carefully with tweezers, being sure to remove the head of the tick. Follow up by cleaning the area well and watching it for any signs of irritation or infection. If Lyme disease is prevalent in your area, be aware of the signs, and call the vet if you have any concerns. The hair between the pads of the feet should also be kept trimmed to help keep the area dry and prevent the growth of yeast and bacteria. Now have a look inside your dog’s mouth. Look for broken or loose teeth, redness of the gums, or any sores or growths in the mouth. Consult with your vet about any areas of concern. Keeping your dog’s mouth healthy is extremely important. Gum disease can lead to all sorts of problems for your dog, including heart disease. Lastly, check your dog’s eyes. Keeping the eye area clean, dry, and free of hair is important. Debris should be cleaned away daily with a warm, wet washcloth. If you see redness or a yellow or green discharge, your pet may have an eye infection. Sometimes keeping the area clean and free of hair will clear it up quickly, but if it seems severe or doesn’t improve with daily cleaning, call your vet for advice. Take the time to evaluate your dog’s health thoroughly at least once a month. Preventive care will ensure that your homestead dog is able to do his/her job, and may save you money on veterinary expenses as well!